This week brought new light to the horror that exists in this country and the complete disregard some have for innocent human life. Bills and comments sparked outrage and reminded us all that the lives lost from abortion are worse than Auschwitz. What is going on with the far left? The Democrat governor of Virginia actually described a case where the baby was born and THEN a decision would be made on what to do next. There was hardly any coverage in the so-called mainstream media, as if it didn’t happen at all. So what do you think? Please add your comment below and also please add it to the comments on the YouTube video. Plus, Nancy Pelosi said that there will be no funding for the border wall. But guess who does use a wall for protection. 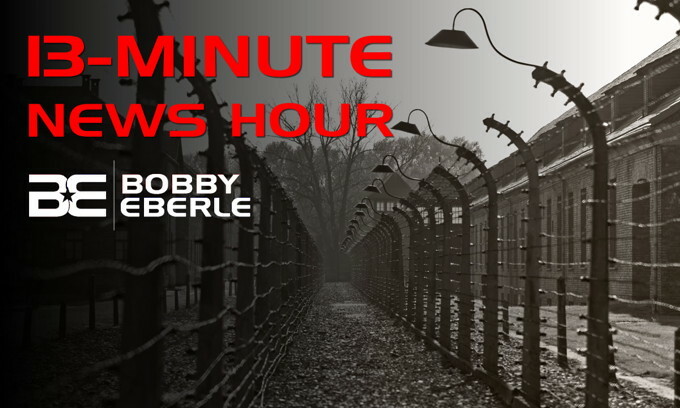 You can see some crazy examples in today’s 13-Minute News Hour. Agreed. Keep these articles coming! With everything that we are seeing, it is readily apparent that the left–from the Deep State to the DNC to the Media and Tech oligarchy–are firmly rooted in a Neo-Marxist, anti-US, globalist movement that is systematically destroying our nation from within. To be perfectly honest, I am astonished that we don’t already have a full-fledged uprising in progress against these domestic enemies! I fear that we simply don’t have the will to fight tyranny anymore–our founding fathers must be spinning in their graves. Well with their antifa goons, i am surprised its THEM that are not doing the uprising to kill off us conservatives..
Or about the occasional Dolphin accidentally killed by fishing boats pulling in Tuna. I can see the Libs now standing before God on Judgment Day. Lib: At least we weren’t as bad as the NAZI’s. IMO they won’t stand in front of him. They will just pass go, and go straight to hell. And if you remember back in 1 and 2 Kings, there was the account of King Ahab and Queen Jezebel, it was Jezebel who caused Israel to worship Baal, to include the sacrificing of children. God was able to humble Ahab, who ended up fearing the Lord. Jezebel, not so much. God made a particular judgment against Jezebel. He declared the dogs would devour her so there would be no burial for her. She would not get a memorial where people could say, Here lies Jezebel. God sent Jehu to tear down Jezebel. He had them throw her out the window of the tower and she died. The wild dogs showed up and tore her to shreds. Nobody buried her. There is no tombstone in Israel to honor Queen Jezebel. Also consider Jesus’ dire pronouncements against Capernaum (Matt 11:23-24). If He had performed similar miracles in Sodom, the people of Sodom would have repented and the city would still be there. And thus it will be worse for the people of Capernaum in judgment. Then if the disciples were to preach in a city and they refuse to hear it (Mark 6:11), it would be more tolerable for the people of Sodom in Judgment Day than for them. We live in the USA, One Nation Under God, the land of Free Speech and Freedom of Religion. If I had to go to Hell I’d rather go from any other country on Earth. The USA has done more to preach righteousness to the world than any other country. Why would any human being with a Heart decide, near birth, that they don’t want a Child?. What’s next, will they kill it when it is born simply because they don’t like something about it?. How would that be any different from killing a infant in the trimester?. Our world has gone crazy, another indication of the end times. Jesus said suffer the little Children to come unto me, for of such is the Kingdom of God. Also said what you do to the least of these will spell your own doom. Jesus is Coming, the indications, and foretelling of this, are abundantly clear. MY take on the last part of the words of Jesus at the “Sermon on the Mount”; “For of such is the Kingdom of Heaven”! As wholly God and yet human, he KNEW in advance their would be children sacrifices! Instead of simply using birth control which costs about $10.00 a month, they CHOOSE to murderachild because they’re inconvenient! Just as a used tampon to be discarded! I have a personal relationship with an Almighty and compassionate God who LOVES children! I can just see; The look on the faces of these people who perform, inform, and those who allow it, when they are inhell (IF they do not repent and/or repeat)! Seeing their precious babies they horribly discarded, safe, secure, happy and LOVED on the OTHER side of a great divide in Heaven! Part of the punishment is not just the pain and misery, but remembering every sin committed when a MUCH better choice was available! God HATES sin and I cannot think of a worse one than take the life of a helpless and innocent baby! God help us for supporting and ELECTING these corrupt, unfeeling, depraved, animalistic sub-humans! I am glad someone now has officially called them out as HITLER and Nazi’s. I would like to start by asking, why do they always call Trump and his supporters Nazi’s and deplorable’s when how much more deplorable is someone who want the legal right to murder babies? Who will be next white, older persons on Medicare or in a nursing home or young person of any color with disabilities???? Slippery slope!!!! And how they whine about baby seals and other wildlife but not humans!!! Come on, do they think the whole world is STUPID? Dear God please forgive these people and our country for even having to debate this issue. I understand that the number of aborted babies is larger than the number of people who were murdered at Auschwitz, but it is an outrageous insult and mockery of those murdered victims of the Holocaust to say that the abortions were worse than Auschwitz. Please stop using this wildly inappropriate and insulting analogy between abortions and the Holocaust!!! Carl, if the shoe fits……. Thanks for posting, Carl. Both are tragic. That’s why I focused purely on the numbers for the given period of time. More deaths from Planned Parenthood. Six million Jews and Six million Christians were killed by Hitler. SIXTY MILLION babies have been aborted in the USA since 1973 Roe v. Wade. All these deaths are an abomination. MOSTLY; Black babies! Why is there not MORE protests from the rabid: “I am offended by everything you say or do”; crowd? I would think there would be WILD objections and screams of RACISM for mur/-der/-ing mostly black children! lucitee, the FOUNDER of Planned Parenthood, and eugenics advocate, Margaret Sanger said that black people are “the weeds of humanity” and need to be “eliminated.” She conceived Planned Parenthood, placed their “clinics” in inner city neighborhoods all over America, and started PUSHING for legalized abortion, which was her PLAN to eliminate those “weeds” she viewed with such contempt. Meanwhile, PP masqueraded as a benign charitable “non-profit,” disguising the founders’ intent by dispensing free or nearly-free birth control pills, pelvic exams and other “women’s reproductive health care,” while they advocated for legalized abortion and waited for the day they could start fulfilling their TRUE PURPOSE, according to their founder. And yet she is IDOLIZED by the LOONY Left. Hillary Clinton cited Margaret Sanger as “one of her heroes” and role models. Brainwashing. That’s the only reason i can see, for WHY they are not more outraged..
Its not an insulting analogy Carl. IF WE call what happened in Auschwitz a holocaust, because of the # of people murdered, how CAN WE NOT EQUALLY CALL the millions of babies murdered by abortion doctors, a holocaust? So the loss of life for some is not as bad as it is for others? Wasn’t that how the Nazis saw the Jews? Peter Singer from Princeton University, that once seminary and now temple to far left indoctrination of learning without any concept of moral responsibility, has been saying that for years. I believe he was the unethical professor of bio-ethics there, if I recall correctly. He advocated the murder of babies up to a month after the child was born. It isn’t the politicians we are fighting, even though many (if not most) of them are firmly entrenched on the wrong side. It’s worse now than it was then. We are our own worst enemy. We’ve learned nothing. I don’t even remotely expect any favor when the ship hits the iceberg, which I suspect will happen. I pray that He has mercy. Ituser, THIS is why there has been an APPALLING increase in the number of teenage “mothers” abandoning their babies in dumpsters to die, etc. They’ve been brainwashed to believe there is LITTLE DIFFERENCE between aborting the baby while in the WOMB, and abandoning or murdering it afterward! And to me, EACH AND EVERY ONE of those ‘mothers’ (IMO they are not worthy of being called a mother), should get charged with Manslaughter at the least, for abandoning their baby in such a fashion. THEN After being convicted, get forcibly STERILIZED! I’m anti-abortion and regard late-term and post-term “abortion” as barbaric infanticide, but comparing that to the murder by gassing, shooting, burning alive, starvation, exhaustion, medical experimentation, and other horrific means of killing men, women, and children in Auschwitz uncaringly trivializes the Holocaust. Perhaps writer Bobby Eberle hasn’t seen photos of Jewish women of varying ages stripped naked and then marched to the edge of a pit, where they were shot and either fell or were shoved into the pit. They then were covered with earth even if they were still alive. Or photos of numerous piles of children’s clothing that were taken from Jewish children after they had been gassed to death. The Holocaust should not be trivialized for any reason. In no way did this article trivialize the holocaust. They were making the comparison to the numbers killed which in the concentration and death camps of WWII was between 11 and 18 million, depending on what account you read. The number of babies killed from abortion since the Roe vs. Wade ruling is over 61 million. I don’t see why people persist in calling it “trivializing” to equate the Holocaust as an act of MASS MURDER to the MASS MURDER of human infants. Millions of Jews were killed in the Fascist Holocaust of WWII. But not ONLY Jews. Never forget that OTHERS were murdered as well–elderly, disabled children, the mentally ill and disabled–ANYBODY who was not “useful” to the Nazi regime was murdered, right along with the Jews. MILLIONS of American babies have been murdered by Planned Parenthood, who has now convinced the morally-bankrupt COMMUCRAT governors and members of some state legislatures that it’s now OK to MURDER babies right up until the moment of birth–or even AFTER THAT, if the baby inconveniently survives an abortion attempt. Hitler and his boys profited by the work from the death camps and then from the gold in the teeth of all of those victims. The German society politely looked the other way. Today, half of this country gleefully participates and promotes the death clinics of Planned Parenthood and their ilk. Death for profit Incorporated! For years they said it is just a fetus. Now it could be newborn…I guess just a wiggling fetus outside the womb. Gee, I guess if children become inconvenient and a source of income to this insane machine we will get new terminology to make it sound ok to cut them up too. What is additionally absurd is that blacks fuss about conservative policies, but it is the left that kill black babies for profit. Still slaves to the Democrats. And demonize the hell out of anyone who’s NOT celebrating abortion on demand. Joe, Planned Parenthood “profits” from the work of their abortion clinic “death camps” every much as much as Hitler did. If you strip away all the dishonest rhetoric and euphemisms employed by the morally bankrupt Left to JUSTIFY this latest iteration of “legalized” murder called abortion, the plain fact is, full-term baby parts sell for a LOT more than early term baby parts. Therefore, by inveigling delusional and EVIL people like Gov. Cuomo to authorize the murder of babies right up until the moment of birth–and even AFTER THAT, if the baby manages to survive their attempts to kill it and be born–they are pushing to have a “better” (more profitable) product that sells for more money than what previous abortion laws allowed. And yeah, the selling of baby body parts for profit is “illegal,” but Leftist-controlled states simply turn a BLIND EYE to what PP is doing. PP donated TWO MILLION DOLLARS to Cuomo’s campaign. You think THAT–and his issuing this ODIOUS proclamation are not connected? It time for SCOTUS to reverse Roe vs Wade and make abortion illegal and prosecute and jail those committing this heinous crime including politicians that condone this abomination to the babies. For all the rest, trust in nothing more than the one who sharpens the sights, and quickens the aim, for they are consumed by their own desires and will yield to only a greater force. ‘The goal of socialism is communism.’ – Vladimir Ilyich Lenin. The Democrat Socialist Party plans on killing most of us in their gulags; they are just starting with the most defenseless. After gun control is implemented, we will all be defenseless. ‘One man with a gun can control 100 without one.’ – Vladimir Ilyich Lenin. As the end of days draws near, Satan knows his time is short and is activating his minions to “steal, kill, and destroy” as the bible says, for him in the extreme . If they do not repent from their wicked sins and turn to Christ, they will spend eternity in the Lake of Fire. There WILL be judgement! To a corrupted immediate gratification Secular Liberal woman, a hangnail is part of her living existence and if anything, even her own fetus that would threaten even that much of her self-diminished human life is eligible to be cut from life like a mere hangnail. If they would bring such misery to their own flesh, just what would they do to WE THE PEOPLE when given the opportunity to remove YOUR innocence and morality that gets in their way. Its the battle between the people who live in the image of the CREATOR versus the American defined CONSUMERS who have been seduced to live in the image of the great CONSUMER. Those who would divide us by gender need only realize and remember, irresponsible abortion NEVER occurred before the women got the vote, and the American gatekeepers of life began to shut up the gate, and build the American wall between life and death of our American innocent. Just who do you think you are? Abortion is a blot on society and a sin in God’s eyes. Considering the insistence upon acceptance of abortion, the LBGT community, and transgender idiocy, the USA is asking for God to destroy us like He did Sodom and Gomorrah. These same sins brought down the roman empire and other civilizations as well. God will not be mocked. DemonRATS now are approving a bill extending abortions to 40 weeks. Conservatives gives new borns a little swat on the rear & they cry…DemonRATS hit new borns along side the head to make them die…Then sell the new born body parts..
Is there a chance this video could have the share feature? My account on FB and twitter reflects a conservative Christian viewpoint and the media is so Left and I wish to portray that reality is with videos like this one. Please help me out here. Didn’t GOP provide funding for planned parenthood? Yup. The bunch of cowards they are.. They did so, to avoid being called racist/sexist. All right everyone is indignant over the horror of killing babies. Isn’t it time we held the GOP accountable as well? Look at them asking fpr our money so they can continue to support the GOP in congress who actively stop legislation the will save unborn babies.